"When You Think of Me"
"I'm Not Gonna Do Anything Without You"
(2002) "When You Think of Me"
"19 Somethin'" is a song written by David Lee and Chris DuBois, and recorded by American country music singer Mark Wills. It was released in September 2002 as the first single from his Greatest Hits album. The song spent six weeks at number one on the Hot Country Songs chart in early 2003. It also reached number 23 on the Billboard Hot 100 chart and was the longest-lasting of Wills's Number One hits. The song would go on to become the number two country song of the Decade on Billboard's Hot Country Songs Chart. In the song's bridge, the singer then expresses his desire to escape to his childhood years ("Now I've got a mortgage and an SUV / All this responsibility makes me wish sometimes / That it was 1980-somethin’"). An uncredited article in the Charlotte Observer said that the success of "19 Somethin'" was "doubly great" because it was a number-one single, and because it was an up-tempo, in comparison to the ballads he had hits with earlier in his career, such as "Don't Laugh at Me" and "Wish You Were Here". "19 Somethin'" was nominated for Single of the Year at the 38th annual Academy of Country Music awards in May 2003. "19 Somethin'" debuted at number 56 on the U.S. Billboard Hot Country Singles & Tracks for the week of October 5, 2002. It was his second number one, the first being "Wish You Were Here" in late 1999. Country music parodist Cledus T. Judd parodied the song as "270 Somethin'" on his 2003 EP A Six Pack of Judd. Judd's parody tells of an obese person who loses weight. ^ Whitburn, Joel (2008). Hot Country Songs 1944 to 2008. Record Research, Inc. pp. 470–471. ISBN 0-89820-177-2. ^ "WILLS UPBEAT ABOUT LATEST HIT, ROCKING `19 SOMETHIN' ' HITS NO. 1 AFTER A STEADY STREAM OF BALLADS". Charlotte Observer. February 7, 2003. Retrieved August 24, 2011. ^ "Keith gets 8 nominations". USA Today. March 4, 2003. Retrieved August 24, 2011. ^ Gilbert, Calvin (January 6, 2003). 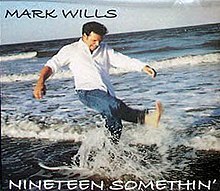 "Mark Wills Tops Country Singles Chart". CMT. Retrieved August 24, 2011. ^ "Mark Wills Chart History (Hot 100)". Billboard. Retrieved January 28, 2011. ^ "Mark Wills Chart History (Hot Country Songs)". Billboard. Retrieved January 28, 2011. "High Low and In Between"